1. European bank exposure continues to decrease (which is not surprising) but there is also quite a bit of rotation going on. 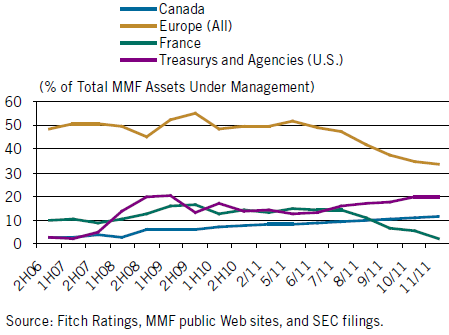 Funds rotated significantly out of France into Canada and somewhat into Japan. Exposure to French banks is now only 3%. 2. The biggest development in US money markets continues to be a shift from unsecured commercial paper and into collateralized instruments, namely repo (as is the case with eurozone banks lending to each other.) The next chart shows the increase in usage of secured lending. This trend will certainly keep US money market funds from major redemptions as we saw in 2008 (particularly with the Reserve fund), but as the earlier post shows, Eurepo rates have collapsed. Lack of product that meets the strict new criteria and near zero rates makes the money markets business unprofitable - it's difficult to charge fees on something that earns close to zero. Money markets funds will continue to be an "asset gathering" mechanism used to lure investors into more profitable asset classes.